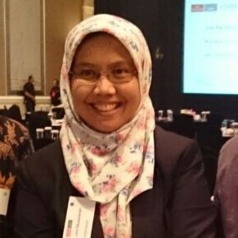 Dr. Umi Muawamah was graduated from different science and technological backgrounds; however, during her last two degrees, she focuses on the area of resource economics with speciality in marine and fisheries. Her professional experience was mainly on the area of economic related to the marine and fisheries conservation. During her post graduate study, she was a teaching and research assistant in the area of environment and resource economics at the University of Rhode Islands (2008) and University of Connecticut (2009-2012). She has an excellent skills in economic modeling tools, bioeconomics, econometrics including descrete choice models, impact evaluation, and software such as MATLAB, SAS and STATA. Her research interests are economics of fishery management, co-management, and science to policy communication. Umi is a member of Indonesian Marine and Fisheries Socio-Economics Research Network (Imfisern).